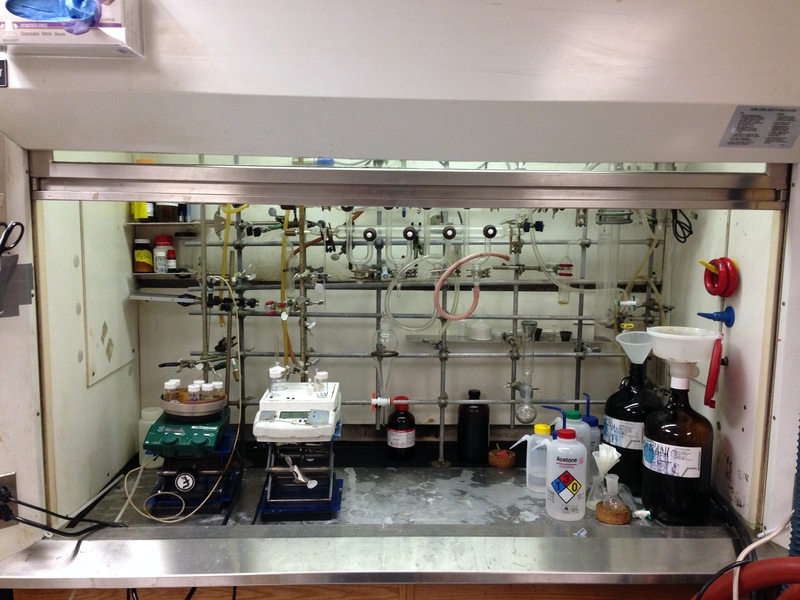 Ever wonder what an organic chemistry lab looks like? Well, wonder no more! I put together this virtual tour of sorts for the curious. I’m going to take you through the facilities and equipment used by those who do what I do. The first stop every morning is the same: I boot up my computer and check Twitter. Twitter has become an immensely useful tool for staying on top of new chemical research and gathering opinions from other scientists. Other bloggers often discuss new methods from recent publications, and combined with scanning the feeds of major chemistry journals, I can get a rapid grasp on what’s important today. 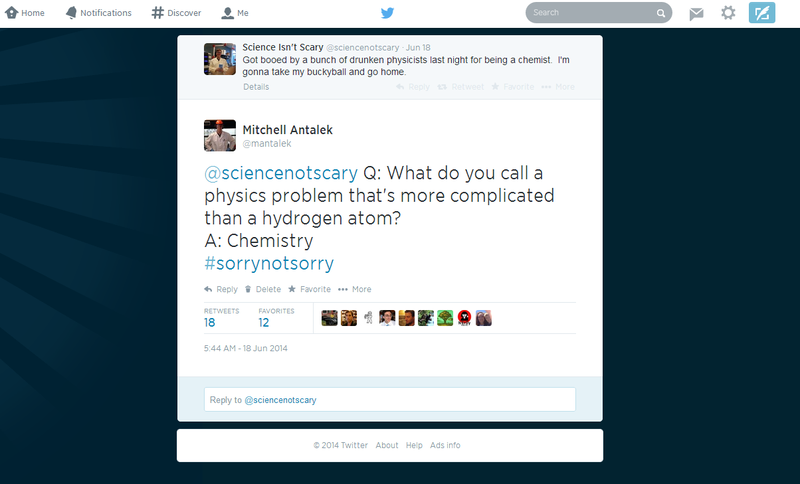 That, and cracking lame chemistry jokes. Next, it’s time to head down to my hood, where I spend the majority of my time. For the uninitiated, a fume hood is a cabinet that pulls in air, creating negative pressure in the area where I’m doing experiments. The air is then run through the ventilation system, and safely vented outside the building. This prevents such unpleasant happenings as me getting a face-full of toxic hydrogen fluoride gas, or tripping out on diethyl ether fumes. 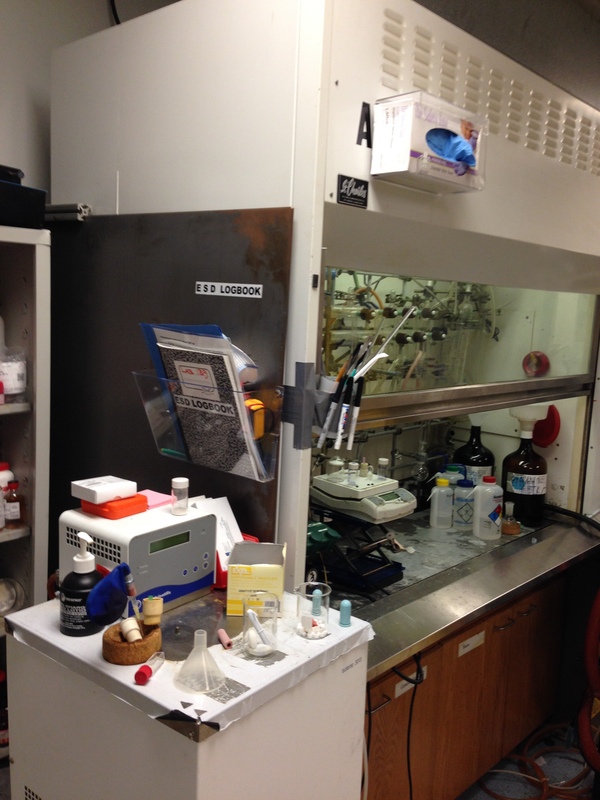 You’ll also notice a bunch of stuff sitting around my fume hood. Starting from the top left, we have shelves of reagents and some glassware I use very frequently. Then there’s the long, glass tube running horizontally across the top of the hood. That’s called a Schlenk line; one end is hooked up to an inert gas (nitrogen or argon) and the other end to a vacuum pump. This allows me to remove air and atmospheric water from a reaction flask, and replace it with inert gas. Some compounds are highly sensitive to air. Continuing to the right, you’ll see some waste containers, and a number of solvent bottles containing chemicals I use so frequently it makes sense to keep a stock of them in my hood. Doubling back to the left (foreground) you’ll see a couple of hot plates, which double as magnetic stirrers. These allow precise control of reaction temperature. Everything so far is something you’d find in pretty much any organic chemist’s workspace. However, you may have noticed the large aluminium plate making up the counter of the hood. Since I work with explosive material, it is critical that the risk of static discharge be eliminated. Rubbing your feet on carpet and then touching the compounds I work with would be inadvisable, to put it lightly. So, my entire workspace is electrically grounded, including the floor in front of the hood. We work with compounds that are SUPPOSED to go boom. Ideally not mid-experiment though. Another component of my workspace somewhat unique to explosive operations is steel armor plating. 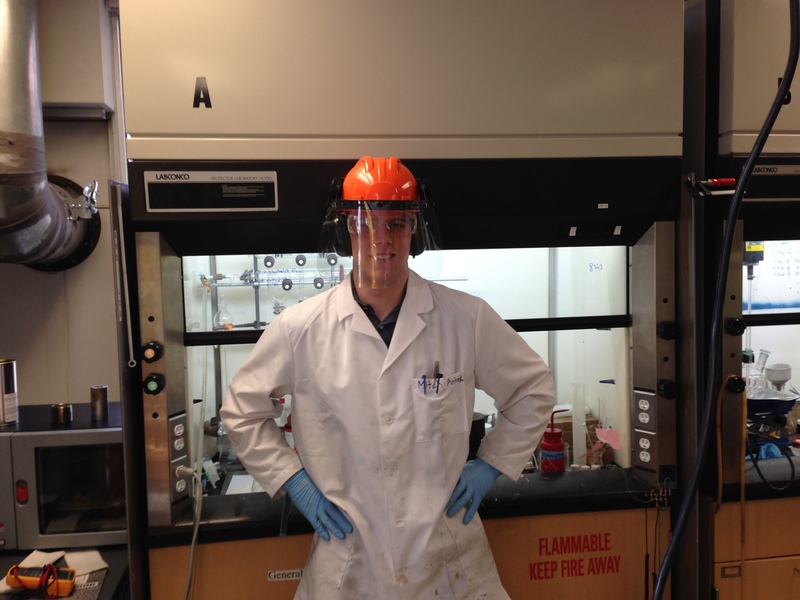 The sides and rear of my fume hood are surrounded by ¼” thick steel plates. In the unfortunate event of an accidental detonation, any fragmentation would be restricted from adjacent labs and hallways. 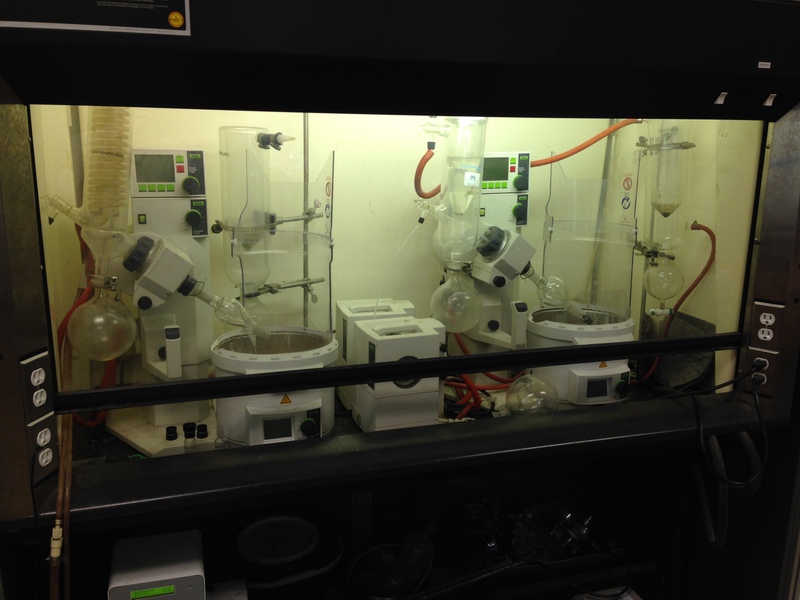 Next to my work area are two rotary evaporators or “RotaVaps.” These allow chemists to rapidly remove solvent from reaction mixtures, isolating the products of the reaction. By placing the mixture under a vacuum and providing gentle heating, the solvent boils much more rapidly (and at a lower temperature) than it otherwise would. A cold trap then cools the gaseous solvent, where it condenses into a liquid in an adjacent flask. Since these RotaVaps are also used for explosive material, they are also armored, just like my hood. Now let’s check out the bread and butter of any organic chemist: the most powerful tool in my structural determination arsenal. I am, of course, talking about nuclear magnetic resonance spectroscopy (NMR). 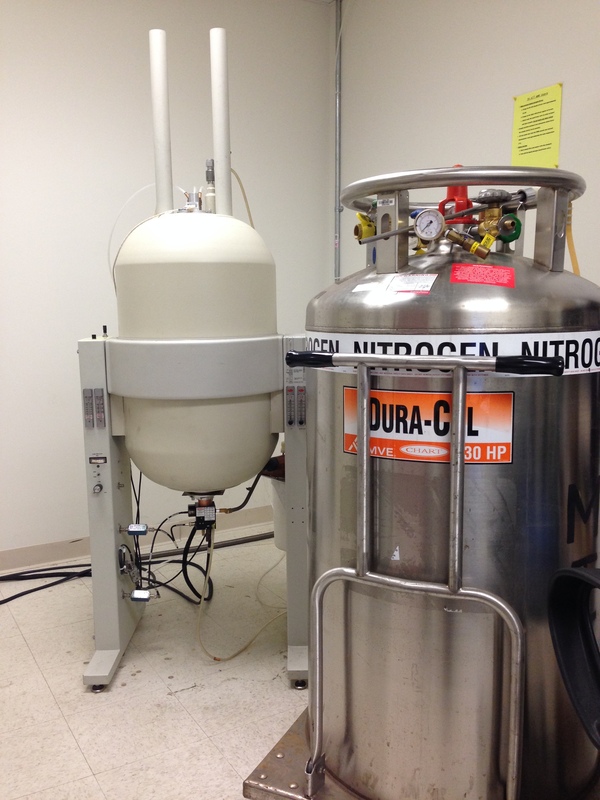 NMR is used to analyze the number and chemical environment of certain active nuclei. Most commonly analyzed is hydrogen, followed by carbon; fluorine, nitrogen, and phosphorous are also active, but much less commonly analyzed. NMR allows chemists to rapidly determine whether or not a reaction has worked as intended, and to verify the structure of compounds. Our nuclear magnetic resonance spectrometer, AKA my one true love. As always, thanks for reading! Feel free to let me know how you felt about this piece, comments, questions, and suggestions are always welcome!